womenforfootball.com- Not that its an excuse for not keeping this blog updated in the past 40 days or so, because a lot happened in World of Football in recent weeks, including; Manchester United’s Champions League elimination at the hands(or rather feet!) of Real Madrid, new global scandal on bribery and match-fixing at crucial football games and ongoing concerns over Brazil’s lack of progress to be able to host millions of fans for 2014 World Cup games. 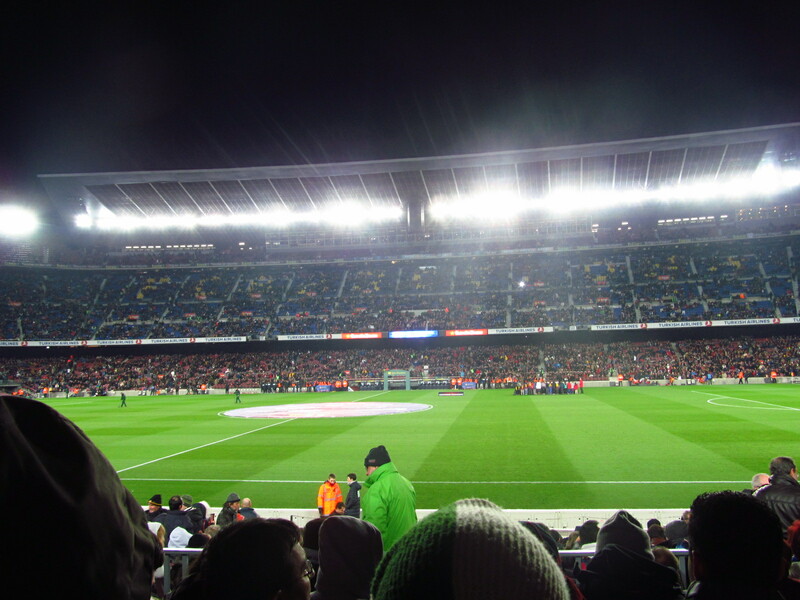 Having said that, the reason I did not get a chance to blog as much is because along with full-time work, I also flew away to Spain for a week to finally watch FC Barcelona live in action at the beautiful Camp Nou stadium. It has always been a dream for me to watch a FC Barcelona match, specially with current crop of talented players. So I booked my ticket online ahead of time for FC Barcelona-Sevilla match, as well as Camp Nou stadium tour and so glad I did because that was the most exciting two days of my life in a long time! 1. Thankfully for La Liga match tickets, they have made it much easier for football fans than in the past. Basically just like easy to use Ticketmaster system for events in U.S and Canada, there is also a Spanish version of Ticketmaster where you can buy match tickets and stadium tour tickets from there. You can select your seat on its easy to use seat map, and buy your ticket online via your credit card(Visa, MasterCard, Amex accepted) and your ticket receipt will be emailed to you. And thats what you need for the match-day. The website is very user-friendly and has English version as well. This is the English version of the website, if you are fluent in Spanish you can browse the default Spanish version http://www.ticketmaster.es. 2. Another way to buy La Liga tickets is through official website of each club. In case of FC Barcelona for instance, you can also buy tickets online directly at http://www.fcbarcelona.com. Through here, you can also print off the ticket confirmation online and just take that to the venue on match day. 3. If you are looking for Copa del Rey, or UEFA Champions League match ticket though, I have noticed those tickets are not offered on ticketmaster.es, but they are available on clubs’ Official websites. But make sure you buy your ticket from official club website though. There are so many scam websites out there, selling fraudulent tickets for you to only find out at the venue that your ticket is not authentic! 4. Price of a typical La Liga match ticket in most part is actually less expensive than English Premier League game tickets. The price range, depending on seat of course range from 50 to 150 Euro. For crucial games such as El Clasico, Real Madrid vs Barcelona, the match ticket is much higher of course. 5. In case of ticketmaster.es tickets though, when you print off the match ticket confirmation and take with you to the venue, at the club ticket kiosk, they will take the confirmation receipt, see your Passport as your ID as well as the credit card you paid the ticket with, and they give you the match ticket. 6. In case of Camp Nou, getting to the venue is not the easiest way with Metro(subway if you are Canadian, or tube if you are English! ), but its doable through changing 1-2 different Metro lines. There is a bit of walk from Metro to the venue, but in general if you ask and follow the huge crowd going there, you will certainly find the venue! On the way return from the match though at midnight, if it is hard to find the walking path towards Metro, you can always take Taxi instead. Taxis in Barcelona are really cheap, so with 5-8 Euros you can get to city centre from Camp Nou. However, after the match at night and specially that its a weekend, the crowd of match attendants seeking taxi always outnumbers number of taxis available, so you may need to be patient to find an empty taxi. 7. If you also want to buy the stadium tour like I did, the Camp Nou stadium tour is valid for 6 months. So any day within the hours they are open, you can visit the stadium. Again you can buy the stadium tour ticket online beforehand via ticketmaster.es, or the club’s official website. 8. If you buy the stadium tour online, when you arrive the stadium on any time of the day you like to take the tour, they still ask you to go to nearest “La Caixa” ATM machine first and get your tour ticket from there. There are so many La Caixa ATMs throughout city of Barcelona and in other cities, and very easily you just insert the code on your ticket confirmation paper, and the credit card in which you paid the ticket with, and it’ll print the tour ticket for you. For some reason I could not figure out, they do not give you stadium tour ticket by seeing your confirmation receipt. If you have not bought your stadium tour in advance though, no worries as there is always spot available in the tour. You can line-up at the club ticket office and get your tour ticket there. 9. My personal recommendation is to not miss on Camp Nou Experience tour. It is really a one of a kind experience as you get to visit players’ hall, visiting team’s dressing room, press room, inside out of the beautiful Camp Nou stadia, the breathtaking view of the stadia from VIP section of press reporters, and taking hands on pictures with Barcelona’s Champions League Cup and also a picture with your favourite FC Barcelona player or the whole squad, in which their photographers nicely Photoshops it for you! 10. And of course do not miss out on FC Barcelona’s store! It has everything from FC Barcelona’s baby clothes to mugs, to mini statue of Messi, to posters and team jerseys. So they have all the merchandise you seel for all your family members really. 11. This applies not only to FC Barcelona store but any store you shop in Spain, that based on EU border regulation though, if you spend over 90 Euro, you can get “VAT return form”(or Tax Return form) at the store cash register, so you can get refunded for VAT(tax) amount of your purchase at the airport when you leave Spain. 12. Last but not least, when you purchase your match ticket online, keep in mind that Time and Date of La Liga games are not confirmed until 24 hours in advance. So make sure you arrive at Barcelona at least a day before, in case the match kicks off a day earlier. In my case for instance, I checked beforehand and saw that the match is scheduled for Sunday night. However because I had found out that the time-date is not confirmed, I booked my flight so I arrive in Barcelona by Saturday afternoon the latest. And so glad I did, because guess what?! On Friday it was announced that the match will kick-off on Saturday night instead! Now imagine if I had flown all the way from Canada to Barcelona to watch this match on that day, only to find out that the game has happened a day earlier! 13. La Liga matches in general kick-off at night. In Spain, watching football during their Saturday or Sunday night is a tradition! So dont be surprised by 9pm or 10pm kick-off time, so eat your dinner in advance because you are in for a long night until midnight for the game. So here are couple of tips I thought to share with you. I hope you find it useful. If you are a passionate football fan, hope one day you can make your dream happen and go to venue of that favourite club of yours to watch a match. If you happen to go, I would love to hear from you here, about the match experiences you had watching the beautiful game. Hi! Oh thank you, glad you like blog posts about Barcelona team! wow, good for you that you a signed Messi shirt! I make sure to write more about Barcelona. Glad you found it helpful Paul! For # 2 do you have to go to the stadium before hand or is what you print online enough to bring with you to the game to get in? Regarding #2, where you buy directly from the club, each club’s process is different. Usually, you’d need to come beforehand to the stadium and pick up the ticket in-person, to validate your ID.